عباس نیا, محسن, طاوسی, تقی, خسروی, محمود. (1396). ارزیابی جامع تغییرات فصلی آینده دمای حداکثر ایران طی دوره گرم بر اساس مدل‌های گردش عمومی جو. مجله آمایش جغرافیایی فضا, 7(25), 121-134. محسن عباس نیا; تقی طاوسی; محمود خسروی. "ارزیابی جامع تغییرات فصلی آینده دمای حداکثر ایران طی دوره گرم بر اساس مدل‌های گردش عمومی جو". مجله آمایش جغرافیایی فضا, 7, 25, 1396, 121-134. عباس نیا, محسن, طاوسی, تقی, خسروی, محمود. (1396). 'ارزیابی جامع تغییرات فصلی آینده دمای حداکثر ایران طی دوره گرم بر اساس مدل‌های گردش عمومی جو', مجله آمایش جغرافیایی فضا, 7(25), pp. 121-134. عباس نیا, محسن, طاوسی, تقی, خسروی, محمود. ارزیابی جامع تغییرات فصلی آینده دمای حداکثر ایران طی دوره گرم بر اساس مدل‌های گردش عمومی جو. مجله آمایش جغرافیایی فضا, 1396; 7(25): 121-134. ارزیابی اثرات پدیده گرمایش جهانی بر رخداد حدی های اقلیمی امری کاملاً بایسته است. لذا در این پژوهش، تغییرات در دمای حداکثر روزانه 44 ایستگاه سینوپتیک در ایران برای دو دوره زمانی آینده نزدیک (70-2041) و آینده دور (99-2071)، تحت دو سناریوی (A2 و B2) از مدل‌ گردش عمومی جو Hadcm3 نسبت به دوره مشاهداتی (2010-1981) مورد بررسی قرار داده شد. همچنین، در زمینه تحلیل میزان عدم قطعیت در پیش بینی رخدادهای دمای حداکثری آینده، از خروجی دو مدل‌ گردش عمومی جو Hadcm3 و CGCM3 تحت تمام سناریوهای انتشار موجود (A2 ،A1B ، B1 و B2) برای بررسی مقایسه‌ای نتایج بر روی 7 ایستگاه نماینده اقلیمی در گستره ایران، استفاده گردید. بدین منظور، پس از بررسی توانمندی مدل آماری SDSM در شبیه‌سازی اقلیم دوره پایه (2010-1981)، مقادیر آینده دمای حداکثر روزانه در مقیاس ایستگاهای مطالعاتی ریز مقیاس گردانی گردید. نتایج حاصل از توزیع فضایی تغییرات دمای حداکثر بر اساس خروجی مدل Hadcm3 نشان داد که در دهه های آینده، نواحی کوهستانی و مرتفع عرض های شمالی ایران در فصل بهار و همچنین پهنه مرکزی ایران در فصل تابستان با بیشترین افزایش دما مواجه خواهند بود. این در حالی است که در هر دو فصل طی دوره گرم سال، نواحی همجوار با سواحل جنوبی ایران، کمترین افزایش دما را خواهند داشت. در این میان بیشترین افزایش در دمای حداکثر آینده نسبت به دوره پایه، به ترتیب برای فصل بهار و تابستان براساس سناریوی A2 حدود (2 تا 4 درجه سلسیوس) و بر اساس سناریوی B2 حدود (1 تا 2 درجه سلسیوس) برآورد شده است. همچنین در تحلیل عدم قطعیت مربوط به مدل-سناریوها، مشخص شد که مدل CGCM3 تحت سناریویB1 در بین مدل-سناریوهای مختلف، بهترین عملکرد را در شبیه سازی دمای آینده دارد. و تغییرات دمایی آینده نیز، بر اساس سناریوهای مختلف مدل Hadcm3 نسبت به مدل CGCM3 شدیدتر می باشد. 2professor of Climatology, Department of Physical Geography, University of Sistan and Baluchestan, Zahedan, Iran. 3Associated professor of Climatology, Department of Physical Geography, University of Sistan and Baluchestan, Zahedan, Iran. Assessment of climate change impacts is quite necessary in the temperature extremes. In this study, the changes in maximum temperature of Iran were comparatively examined in two future periods (2041-70 and 2071-99) and based on the output of general circulation models of Hadcm3 under existing scenarios (A2 and B2) than the base period (1981-2010). Also, in the field of uncertainty analysis in occurrences prediction of future maximum temperature, the outputs of two general circulation models of Hadcm3 and CGCM3 under all existing scenarios (A2, A1B, B1 and B2) were carried out for comparison examination onto the results of the 7 representative climatic stations of Iran.For this purpose, after examining the ability of statistical model of SDSM in simulation of base period (2010-1981), the daily future values of maximum temperature were downscaled in the studied stations scales. The results of spatial distribution of maximum temperature showed that in the future decades, mountainous areas and high lands located in northern areas of Iran, during spring, and the central areas of Iran, during summer, will experience the greatest increase in temperature. This is while; during both seasons of warm period of the year the areas adjacent to the southern coasts of Iran will experience the lowest temperature increase. Meanwhile, the largest increase in maximum future temperature for spring and summer in compare to base period are estimated according to A2 scenario about (2-4 degrees Celsius) and according to B2 scenario about (1-2 °Cg), respectively. In uncertainties analysis related to model-scenarios, it was found that CGCM3 model under scenario B1 had the best performance in the simulation of future maximum temperatures among different scenario-models. Also, the increase in maximum temperature has been more severe based on various scenarios of Hadcm3 model than the CGCM3 model. بابائیان، ایمان و زهرا نجفی نیک. 1385. معرفی و ارزیابی مدل LARS-WG برای مدل­سازی پارامترهای هواشناسی استان خراسان در دوره 1961تا 2003، مجله نیوار، شماره 62 و 63. حمیدیان‌پور، محسن، محمد باعقیده و محسن عباس‌نیا. 1395. ارزیابی تغییرات دما و بارش جنوب‌شرق ایران با استفاده از ریزمقیاس گردانی خروجی مدل‌های مختلف گردش عمومی جو در دورة 2011-2099، پژوهش‌های جغرافیای طبیعی،شماره 48. صداقت کردار، عبداله و ابراهیم فتاحی. 1387. شاخص‌های پیش آگاهی خشکسالی در ایران، مجله جغرافیا و توسعه، شماره 11. علیجانی، بهلول. 1385. آب وهوای ایران. جلد اول. چاپ ششم، تهران، انتشارات پیام نور. فلاح قالهری، غلامعباس. 1393. ریز مقیاس نمایی آماری داده‌های اقلیمی. چاپ اول، مشهد، انتشارات سخن گستر. مجرد، فیروز و سعید بساطی. 1393. واکاوی تغییرات زمانی و مکانی دماهای حداکثر در ایران، مجله مدرس علوم انسانی- برنامه ریزی و آمایش فضا، دوره 18، شماره 2. مسعودیان، سید ابوالفضل. 1384. بررسی روند دمای ایران در نیم سده­ی گذشته، پژوهش‌های جغرافیایی، شماره 54. مسعودیان، سید ابوالفضل و مسعود کاویانی. 1387. اقلیم شناسی ایران. چاپ اول، اصفهان، انتشارات دانشگاه اصفهان. Abbasnia, M., and Toros, H. 2016. Future changes in maximum temperature using the statistical downscaling model (SDSM) at selected stations of Iran. Journal of Modeling Earth Systems and Environment, 2(2), 1-7. 10. Covey, C., AchutaRao, K.M., Cubasch, U., Jones, P., Lambert, S.J., Mann, M.E., and Taylor, K.E. 2003. An overview of results from the Coupled Model Intercomparison Project. Global and Planetary Change, 37(1), 103-133. 11. Dracup, J.A., and Vicuna, S. 2005. May. An overview of hydrology and water resources studies on climate change: the California experience. In World Water Congress, pp: 15-19. 12. Horton, B. 1995. Geographical distribution of changes in maximum and minimum temperatures. Atmospheric Research, 37(1), 101-117. 13. IPCC. 2001. Climate Change: The Scientific Basic. Contribution of Working Group 1 to The Third Assessment report to the Intergovernmental Panel on Climate Change. Cambridge University Press, Cambridge, UK, and New York, N.Y., U.S.A., 881pp. 14. IPCC. 2007. Climate Change 2007: the physical science basis. In: Solomon, S., Qin, D., Manning, M., Chen, Z., Marquis, M., Averyt, K.B., Tignor, M., Miller H.L. )Eds(, Contribution of Working Group I to the Fourth Assessment Report of the Intergovernmental Panel on Climate Change. Cambridge University Press, Cambridge. 15. IPCC. 2013. Climate Change 2013: The Physical Science Basis. Contribution of Working Group I to the Fifth Assessment Report of the Intergovern-mental Panel on Climate Change Intergovernmental Panel on Climate Change Cam-bridge, United Kingdom and New York, USA. 17. Islam, S., Rehman, N., and Sheikh, M.M. 2009. Future change in the frequency of warm and cold spells over Pakistan simulated by the PRECIS regional climate model. Climatic change, 94(1-2), 35-45. 18. Jacovides, C.P. 1998. Reply to comment on “Statistical procedures for the evaluation of evapotranspiration computing models”. Agricultural Water Management, 37(1), 95-97. 19. Jones, P.D., and Moberg, A. 2003. Hemispheric and large-scale surface air temperature variations: An extensive revision and an update to 2001. Journal of Climate, 16(2), 206-223. 20. Jones, P.D. 1994. Hemispheric surface air temperature variations: a reanalysis and an update to 1993. Journal of Climate, 7(11), 1794-1802. 21. Mahmood, R., and Babel, M. S. 2013. Evaluation of SDSM developed by annual and monthly sub-models for downscaling temperature and precipitation in the Jhelum basin, Pakistan and India. Theoretical and applied climatology, 113(1-2), 27-44. 22. Mahmood, R., and Babel, M.S. 2014. Future changes in extreme temperature events using the statistical downscaling model (SDSM) in the trans-boundary region of the Jhelum river basin. Weather and Climate Extremes, 5, 56-66. 23. Nasri, M., and Modarres, R. 2009. Dry spell trend analysis of Isfahan Province, Iran. International journal of climatology, 29(10), 1430-1438. 24. Revadekar, J.V., Kothawale, D.R., Patwardhan, S.K., Pant, G.B., and Kumar, K.R. 2012. About the observed and future changes in temperature extremes over India. Natural hazards, 60(3), 1133-1155. 25. Salon, S., Cossarini, G., Libralato, S., Gao, X., Solidoro, C., and Giorgi, F. 2008. Downscaling experiment for the Venice lagoon. I. Validation of the present-day precipitation climatology. Climate Research, 38(1), 31-41. 26. Tonkaz, T., Çetin, M., and Tülücü, K. 2007. The impact of water resources development projects on water vapor pressure trends in a semi-arid region, Turkey. Climatic Change, 82(1-2), 195-209. 27. Toros, H. 2012. Spatio‐temporal variation of daily extreme temperatures over Turkey. International Journal of Climatology, 32(7), 1047-1055. 28. Wang, X., Yang, T., Shao, Q., Acharya, K., Wang, W., and Yu, Z. 2012. Statistical downscaling of extremes of precipitation and temperature and construction of their future scenarios in an elevated and cold zone. Stochastic environmental research and risk assessment, 26(3), 405-418. 29. Whan, K., Alexander, L. V., Imielska, A., McGree, S., Jones, D., Ene, E., and Vaiimene, M. 2014. Trends and variability of temperature extremes in the tropical Western Pacific. 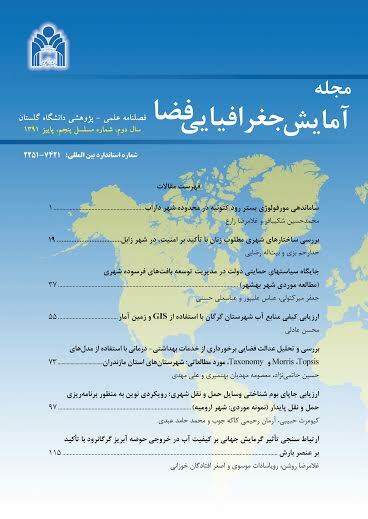 International Journal of Climatology, 34(8), 2585-2603. 30. Wilby, R.L., Dawson, C.W., and Barrow, E.M. 2002. SDSM—a decision support tool for the assessment of regional climate change impacts. Environmental Modelling & Software, 17(2), 145-157. 31. Wilby, R.L., and Dawson, C.W. 2013. The statistical downscaling model: insights from one decade of application. International Journal of Climatology, 33(7), 1707-1719. 32. Yue, S., and Hashino, M. 2003. Temperature trends in Japan: 1900–1996. Theoretical and Applied Climatology, 75(1-2), 15-27. 33. Zhang, Q., Xu, C.Y., and Zhang, Z. 2009. Observed changes of drought/wetness episodes in the Pearl River basin, China, using the standardized precipitation index and aridity index. Theoretical and Applied Climatology, 98(1-2), 89-99.